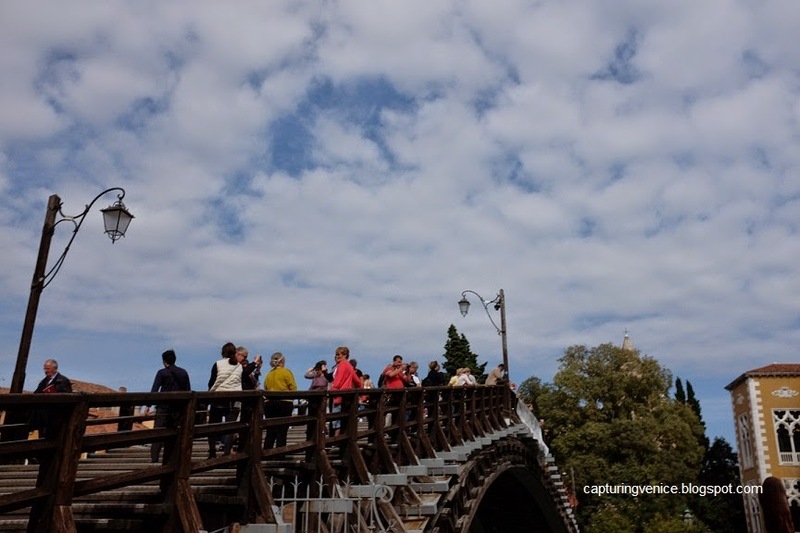 A photosharing website, Sightsmap.com, recently reported that the Accademia Bridge is Venice’s most photographed sight (for a reference to the report, read this link from the UK Telegraph). I must admit that I'm skeptical about this report – I could have sworn that the depths of the Piazza San Marco, or the Palazzo Ducale, or the golden domes of the Basilica would trump the Accademia Bridge, especially since the hordes of tourists seem to head straight to the Piazza. The classic view down the Grand Canal toward the Salute from the Accademia Bridge is gorgeous and much celebrated, but the bridge in itself is not particularly photogenic. This is a view of the bridge from the Dorsoduro end...do you see what I mean? View of the Accademia Bridge, seen from the Dorsoduro side. Photograph by Capturing Venice. But I really love the plain, practical solidity of the Accademia bridge. Its steps are easy to climb - just the right height, just the right width (unlike the new Calatrava bridge at the other end of town upon which you risk your limbs as you descend its slippery, reflective and uneven steps). 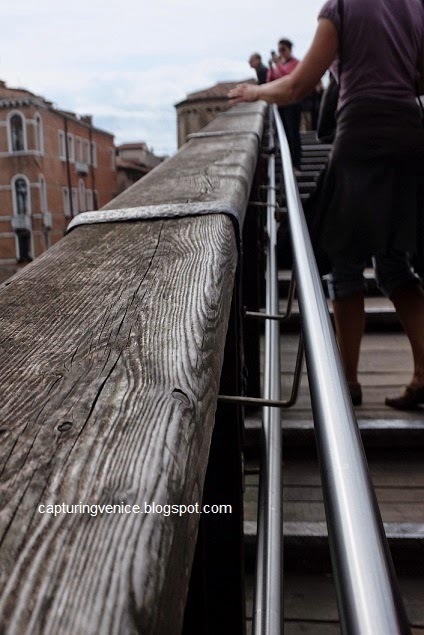 I love the sturdiness and homeliness of the wood of the Accademia bridge. I love walking up the Accademia bridge, pressing the palm of my hand flat against the broad, smooth balustrade. Balustrade of the Accademia Bridge. Photograph by Capturing Venice. I love standing at the base of the Accademia bridge on the San Marco side, and spotting my favourite lion in the garden of the Palazzo Cavallo-Franchetti (I've written about him previously - you can see a photo of him by clicking here). I love standing on the Accademia bridge and counting the number of painted wooden mooring poles that line the edges of the Grand Canal. I love watching the vaporetti and motor boats coming and going beneath the bridge. I love standing on the bridge and admiring the skill of the gondoliers as they maneuver their beautifully elegant vessels around the motor traffic. I love it when I get high enough on the bridge to look down the Grand Canal and see the familiar flat rooftop of the Palazzo Venier dei Leoni, home of the Peggy Guggenheim Collection. And I love the reward of this view when you reach the top of the bridge. 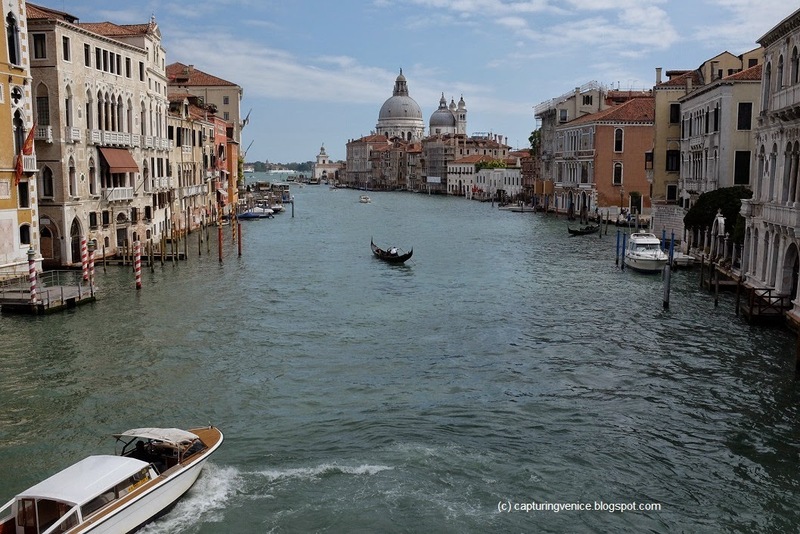 View of the Grand Canal from the top of the Accademia Bridge in Venice. Photograph by Capturing Venice. The Accademia Bridge is one of four bridges that span the Grand Canal, and provides access from the Campo San Vidal (in San Marco) across to Campo della Carità and the Accademia di Belli Arti di Venezia (in Dorsoduro). The first bridge was a steel structure was designed by the English firm, Alfred Neville in 1854. A temporary wooden bridge (designed by Eugenio Miozzi) was erected in 1933, and a replica of this wooden bridge was constructed in 1985.